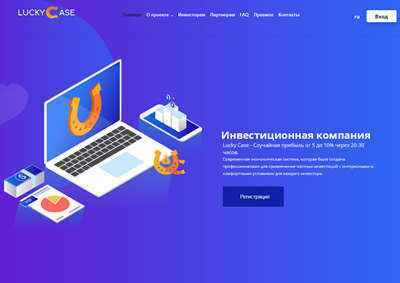 Компания Lucky Case LTD была создана профессионалами для привлечения частных инвестиций с интересными и комфортными условиями для каждого инвестора, а также с уникальной идеей случайного определения процента прибыльности. Мы занимаемся анализом инвестиционных возможностей и предлагаем свои услуги новичкам, чтобы избежать рисков и потерь от неправильных инвестиций. 08.02.19 15:56 Transfer Sent Payment: 60.00 USD to account U18063826 from U1294xxx. Batch: 245803454. Memo: Shopping Cart Payment. Invoice 70, all-hyips.info. Memo : Shopping Cart Payment. Invoice 74, . Опять шаблон переделали Вы хоть код подтирайте, чтобы не так очевидно было. The domain lucky-case.com is listed for sale. оперативно у него все, максимум прибыли хочет получить при минимальных затратах. на данный момент смущает немного то, что заявлен инстант, а на монах висит ожидание, и выплат не видно... работает инстант или нет? 09.02.19 04:41;Account;Receive;Received Payment 0.6 USD from account U18063826 to account U1294000. Batch: 245850513. Memo: API Payment. Invoice 202, all-hyips.info. The amount of 10 USD has been withdrawn from your account. Accounts: U9759***->U18063826. Memo: Shopping Cart Payment. Invoice 223, HeXuTpaH.. Date: 10:16 09.02.19. Batch: 245877945. 09.02.19 13:42	Transfer	Sent Payment: 100.00 USD to account U18063826 from U7679551. Batch: 245899638. Memo: Shopping Cart Payment. Invoice 270, elitemonitorcom. 09.02.19 15:08	Receive	Received Payment 0.9 USD from account U18063826 to account U7679551. Batch: 245908416. Memo: API Payment. Invoice 299, elitemonitorcom. The amount of 20 USD has been withdrawn from your account. Accounts: U8824...->U18063826. Memo: Shopping Cart Payment. Invoice 84, tester.. Date: 17:03 08.02.19. Batch: 245811059. The amount of 21.4 USD has been deposited to your account. Accounts: U18063826->U8824... Memo: API Payment. Invoice 301, tester.. Date: 15:12 09.02.19. Batch: 245908870. Последний раз редактировалось vlache; 09.02.2019 в 18:36. The amount of 31.8 USD has been deposited to your account. Accounts: U18063826->U1*****. Memo: API Payment. Invoice 362, ***t.. Date: 16:28 09.02.19. Batch: 245917136. 09.02.19 17:06	Receive	Received Payment 4.5 USD from account U18063826 to account U7679551. Batch: 245920448. Memo: API Payment. Invoice 382, elitemonitorcom. Memo : API Payment. Invoice 282, . The amount of 109 USD has been deposited to your account. Accounts: U18063826->U*. Memo: API Payment. Invoice 409. Date: 18:39 09.02.19. Batch: 245928127. 09.02.19 19:22	Receive	Received Payment 10.7 USD from account U18063826 to account U704****. Batch: 245932209. Memo: API Payment. Invoice 421, Lindemann. 09.02.19 19:54;Account;Receive;Received Payment 3.6 USD from account U18063826 to account U1294000. Batch: 245934447. Memo: API Payment. Invoice 437, all-hyips.info. 09.02.19 21:29	Receive	Received Payment 0.6 USD from account U18063826 to account U7679551. Batch: 245940303. Memo: API Payment. Invoice 466, elitemonitorcom. Memo : API Payment. Invoice 405, . Криптовалюта RaiBlocks — это аналог Биткоина? Начни свою карьеру в медиа. Стажировки и работа мечты!